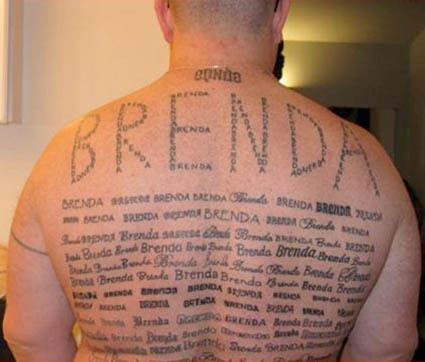 Home Blog Brenda Name Tattoo – Bad, Creepy or Both? Lock your doors, Brenda, lock your doors. Is this a bad name tattoo or just a bad tattoo? Either way it would take a lot of tattoo makeup to cover and seems a little creepy to us. Found http://www.teamjimmyjoe.com/2011/08/bad-tattoo-965/. That is just creepy! I agree Brenda!! Lock your doors and pull the shades down! Thats just creepy!! I agree Brenda,losk your doors and pull down the shades! !